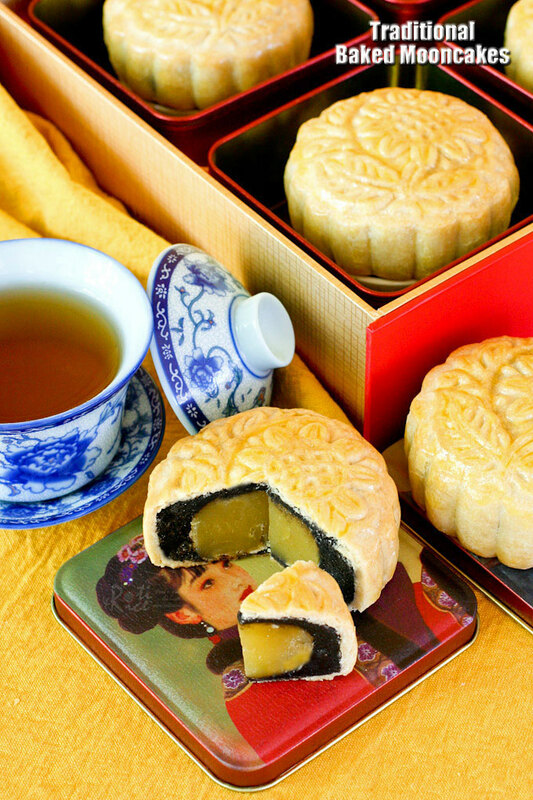 Traditional Baked Mooncakes are a real treat for the Mooncake Festival. 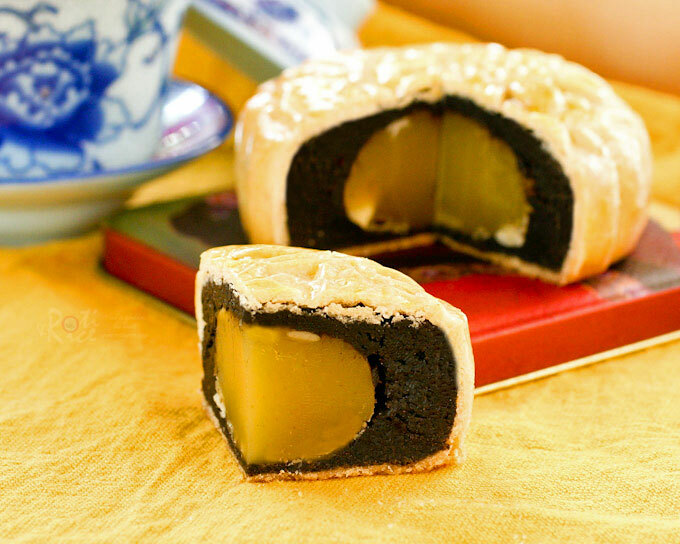 These delicious pastries are filled with lotus seed and black sesame paste filling. Running around the woods with those little piggies was too much fun! It was nostalgic and certainly recaptured part of the childhood excitement of past Mooncake Festivals where my brothers and I ran around the neighborhood with our candle-lit lanterns. Remember those bright red glass paper lanterns stretched over wire? They were magnificent and came in various shapes and sizes. Among the favorite in those days were the dragon, rabbit, cockerel, and piggy. In later years the kids favored cartoon characters, jets, and tanks. Even our candle-lit tradition was de-romanticized and replaced with battery powered LED that twinkle in the dark. Although these were safer and the lanterns will never burn, they do not have the charm of the candle-lit ones. As a child, choosing the perfect lantern was the focus of the season. When we were littler Dad brought home the lanterns. As we grew older, we had the privilege of going to the store to choose our own lanterns. Those were fun trips! We were wide-eyed and excited. The lanterns were usually hung from the ceiling and had to be brought down with a hooked pole once a selection was made. Making a selection was not the easiest thing to do. The lanterns were closely hung together and the ceiling seemed so high up and the lanterns so far away. Nevertheless, after much deliberation and angst, a selection was made and the lantern carefully brought down for inspection. It was important that the lantern be well balanced. Usually some minor adjustments to the length of the strings tying the lantern was all that was needed. A tilted lantern may cause it to go up in flames and this is a sad thing especially early in the season. Having to be contented with just candles or an accordion style lantern wasn’t as much fun. Those were the good ol’ days! I have long since joined the ranks of the tradition bearers and turn my attention from brightly lit paper lanterns to the staid formality of Traditional Baked Mooncakes. What were once peripheral items for me as a kid is now my central focus for the season as an adult. Even though I have never made Traditional Baked Mooncakes up until now, I would plan and carefully select one or two boxes from the store each year. 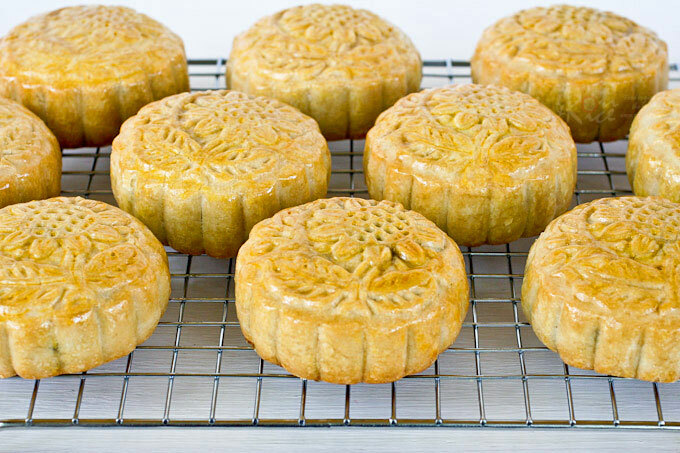 Like all seasonal food, mooncakes are only eaten once a year and if you miss it, you will have to wait until the next year to savor these delectable cakes. Chinese pastry shops all over China and Southeast Asia have been busy churning out boxes of mooncakes to meet the demand. Prices are high, even exorbitant but people continue to buy them. Today, it has taken on the role of a “status” gift exchange. To commensurate with the latter, the packaging has become an exquisite art form, a far cry from the humble red box that was once the norm. 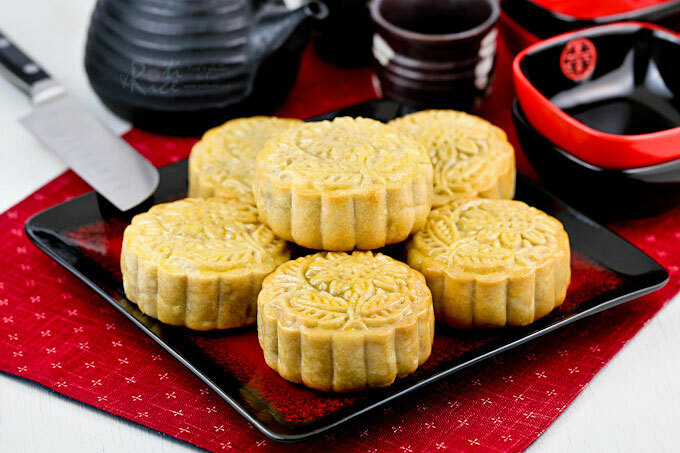 In the “old” days, mooncakes had only one type of crust with three basic filling – lotus seed paste with or without egg yolk, red bean paste, and mixed fruits and nuts. Today, there are tens of flavor combinations and several styles of pastry crust. It is always exciting to try something new and some are really good but many are just fads. Having seen mooncakes popping up in the blogosphere during the festival in past years, I was determined to make my own this year. When I visited my parents in June, I managed to purchase a mooncake mold, a package of snowskin premix and red bean paste, but little else related to mooncakes. Never fear for Ro-Ri San is here! He had a business trip to Asia planned for early September, the perfect time for picking up ingredients for mooncakes. With detailed directions from my dear friend, Ann of Anncoo Journal, Ro-Ri San was able to buy the essential ingredients from a bakery supply store in Singapore…YAY! As soon as he got home, I immediately set to work. Not a moment to lose as Mooncake Festival which is the 15th day of the 8th moon of the Lunar calendar falls on September 30th this year. 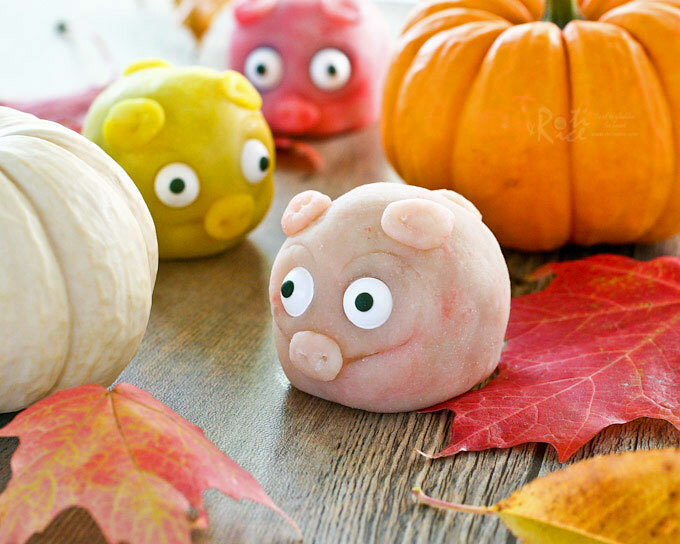 I started with these cute little Snowskin Mooncake Piggies adapted from Anncoo Journal. I had so much fun making these and was delighted with the outcome. The snowskin was soft and smooth and the cakes were delicious. Yes, all 10 are gone now! Ro-Ri San bought a package of black sesame paste which I have never tried before. I could not wait to put it to good use. Guess what? I found just the right recipe at Anncoo Journal. 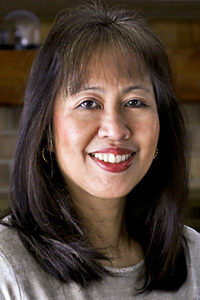 Ann has several mooncake recipes and a wealth of other baking recipes on her blog. Do check them out. I did change the recipe to suit local measuring conditions and availability of ingredients. Instead of Hongkong flour which is a low gluten flour used for making bao, I used cake flour. I also used maple syrup in place of golden syrup and canola oil in place of peanut oil. I am not sure if the different ingredients may have caused the mooncakes to be paler in color even though I left them baking for a longer period of time. I have adjusted the baking temperature in the recipe below to 375°F (190°C) from 350°F (180°C). Hopefully my future batches will have the desired coloration with an increase in baking temperature. 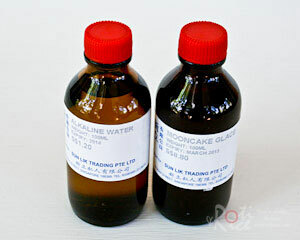 I also read here that alkaline water is necessary for the browning of the mooncakes. Perhaps I should add just a little bit more the next time. Finally, a little bit about the mooncake mold. They do come in different sizes. Mine is a large one for mooncakes weighing between 150g to 185g. A good mooncake should have a very thin crust with a ratio of 1:3 parts dough to filling. This is no simple task for beginners and most people tend to start with a 1:2 ratio. I decided to go with a 1:2.5 ratio with 45g of dough and 115g of filling. It was quite challenging to get that little bit of dough to wrap around the huge ball of filling but it can be done. It takes patience and practice. You will also need a 150g to 185g mooncake mold. Dry fry kuachi (melon seeds) over medium heat for about 3 to 5 minutes. Remove and allow it to cool. Mix into lotus seed paste. Form into 10 balls measuring slightly approximately 1.5 oz (45g) each. Divide black sesame paste into 10 portions of 2.5 oz (70g) each. Wrap each portion of black sesame seed paste over each portion of lotus seed paste forming 10 balls of filling. Sift cake flour into a large bowl. Make a well in the center. Combine maple syrup, vegetable oil, and alkaline water in a small bowl or measuring cup. Pour syrup mixture into well and mix with a spatula to form a soft dough. Cover and let it rest for 30 minutes. Lightly dust working surface with cake flour. Knead dough until smooth adding a little flour if necessary. Divide into 10 portions of 45g each. Take a portion of the dough and spread it into a circle of about 4 inches (10cm). Wrap a ball of filling with the dough. Roll the ball of dough and filling between your two palms to smoothen. 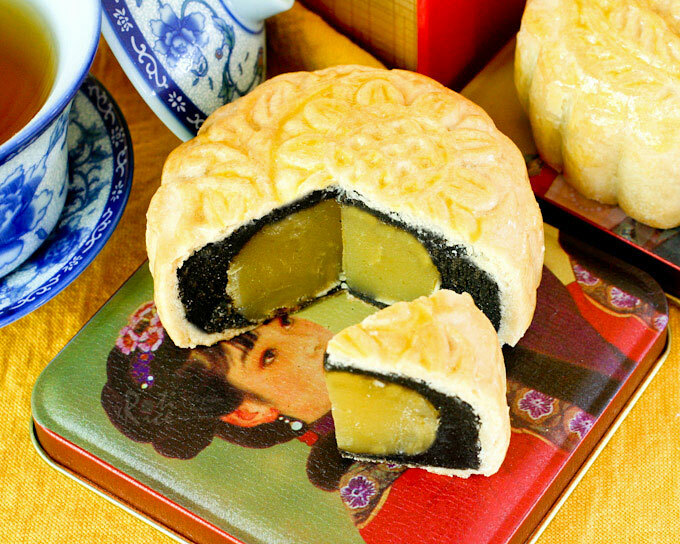 Place into a flour dusted mooncake mold. Flatten dough to conform to the shape of the mold. Place on your working surface and carefully press spring stamp down to get a nice pattern on the top. 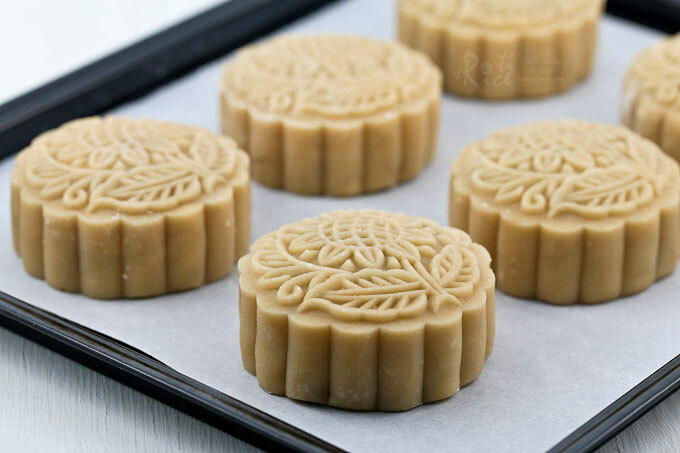 Lift mold and gently release mooncake onto your palm. Place on a parchment lined baking tray. Repeat with the remaining dough and filling. Bake in a preheated 375°F (190°C) oven for 10 minutes. Remove from oven and allow mooncakes to cool for 5 minutes. Brush on egg wash and return to oven for another 8 to 10 minutes. Remove from oven and brush on some mooncake glaze just on the top of mooncakes. Place on a wire rack to cool completely. Store in an airtight container for one to two days before serving. These mooncakes were made in September 2014. I made them a little “taller” by using more dough and filling with the ratio of 1:2.5. Instead of maple syrup, I used a flavored brown rice syrup which gave the mooncakes a deeper golden color and a nice fragrance. Biren, Good try on your first attempt making this traditional mooncakes. They look pretty! I remember the first time when I made the mooncakes, someone told me to add some dark brown coloring or even dark soya sauce to darken the mooncakes but I’ve never tried them before 🙂 Actually you can make your own sugar syrup. The color and taste are so good and better to use even for keeping it for a year. I can email the recipe to you if you want. Just let me know. Happy Mid-Autumn Festival to you and your family! Happy Mid-Autumn Festival to you too! Those mooncakes look incredible! Something to try! I love this post Biren as it reminds me of when I lived in Singapre from late summer until early winter one year. I attended the Mid Autumn festival with local friends and it was magical. Between the lanterns and the beautiful mooncakes. Now I know how to make them to thanks to you! Thank you. Thanks Toni! I am so glad to hear you got to experience the Mid-Autumn Festival. It is one of the many celebrations I miss in the old country. I saw some mooncakes at the Asian market this week but yours are far prettier and I bet much, much better tasting. The mould is great! So pretty! Thanks Jean for your kind words! I am so glad I managed to buy this mold when I visited in June although it was a tad early. The store bought filling is a great help. Otherwise it will be much more difficult as making lotus seed, black sesame, and red bean paste is very time consuming. Beautiful mooncakes, Biren! 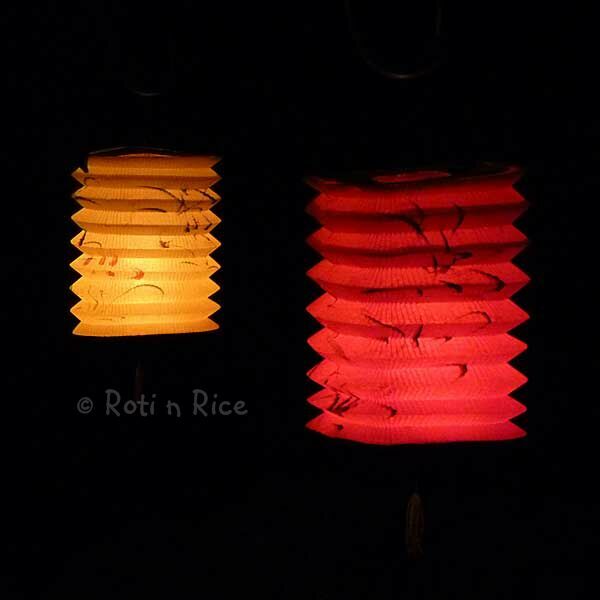 I am gonna bring my kids to shop for lantern this weekend, nowadays they have so many “fancy” ones .. I still prefer the good ol’ paper ones which you put candles in. Not the battery operated ones. They’re so beautiful! The finished product reminds me of the Arab ma’amul – a semolina cookie filled with either nuts or dates. They are also made in a special mold, although the ma’amul molds don’t have that handy pushing-out feature! Also, what a lovely shot of the lanterns. Really pretty. Thanks Ruby! Those ma’amuls sound interesting. I am sure they are as tasty as they are beautiful. 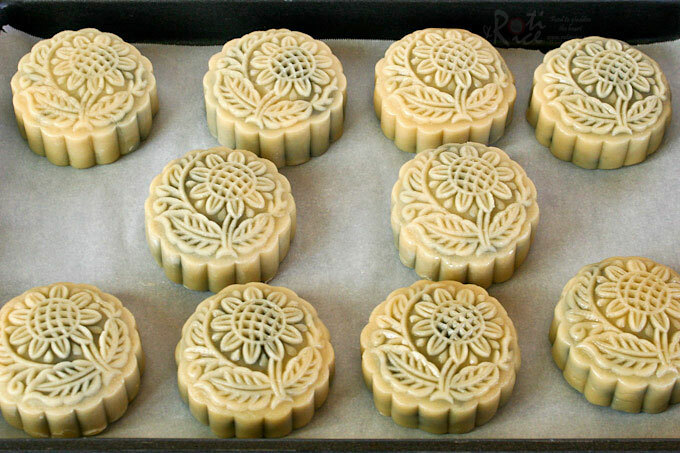 Actually, the old mooncake molds are made of wood and do not have the pushing out feature. Thanks to modern innovation, some things have become more efficient. 🙂 I love that shot too! They appear to be floating! They are so pretty, Biren. i too enjoyed making mooncakes, it’s like play dough:D Your mooncakes look really pretty! Thanks Jeannie! The pattern was a little more pronounced before baking but I can’t complain since this is my first try. I see that you already have this boxed up so can I place an order for 6 boxes? 🙂 I do love black sesame paste, but I haven’t tried the lotus paste. These mooncakes are just perfect and the most beautiful mooncakes I’ve ever seen! With this post and the last one you are inspiring me to give these a go. Beautiful, just beautiful and I know they taste delicious! Biren, your baked mooncakes are gorgeous….as good as those piggy mooncakes. Kudos! I love the mould as well. Very pretty. Wishing you & your family a very Happy Mid Autumn Festival, dear. Enjoy & have a fabulous time. Thanks Kristy and I hope you had a wonderful celebration as well with your family. This is such a cool post! You’ve really outdone yourself this time – these are terrific! Finding ingredients might be a bit of a challenge, but these look wonderful. Very useful and informative – thanks so much. Thanks Raymund! I imagine there must be quite a few Chinese immigrants to NZ bringing with them the said goodies. I was so glad I managed to buy one of those molds back in June. Only one design left but I wasn’t complaining. They are not as charming as the wooden ones but they do make the job much easier. Beautiful, beautiful, beautiful, that’s all I can say. And with two different fillings combined together. I bet they were delicious. 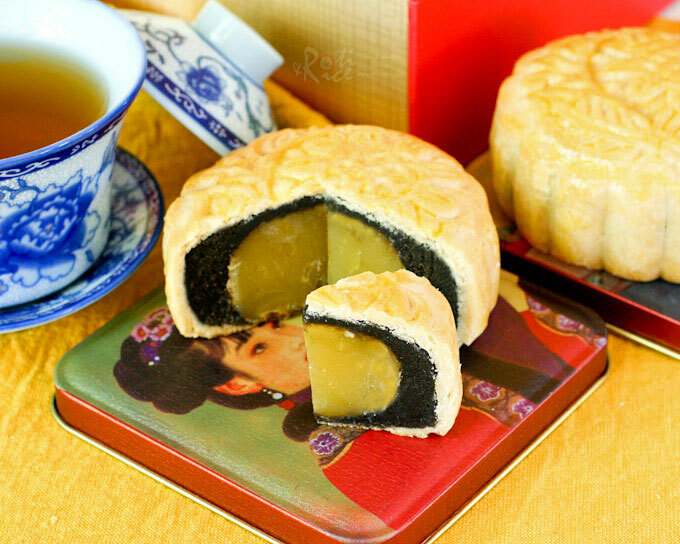 I love both lotus paste and black sesame, although I have never tasted black sesame mooncake. Well done, you! Now I know what these plastic plungers are for. Hi Biren! I just love your site. I have a question…is the alkaline water necessary for this recipe or can I omit it? I don’t know where to find it and there are no Asian food markets where I live. Thanks for your help. I know you said it’s necessary for browning the mooncakes, but I’m not planning on giving these as gifts or anything. You should be able to purchase alkaline water at most Asian grocery stores here in the US. However, if you are not able to get to a store, you do not have a choice but to omit it. I have to say here that the necessity of the alkaline water for browning is something that I read at another blog. (Please click on the link above to get to the post). However, I made these mooncakes a second time using Log Cabin All Natural Table Syrup and the mooncakes had a nice golden color. You can see my second batch here. I did continue to use the alkaline water though. Both the maple syrup and the table syrup gave the mooncakes a very nice fragrance. Thanks for your response Biren! I will try to find it because this recipe looks too good to pass up :-). I am indeed v impressed with your mooncakes. Keep it light in color, it actually looks great, in my opinion! I am certain it does taste great too. Living in Asia makes us so lazy, we just go and buy them. I remember when I was living in Perth, WA, a girl friend made the ones with ham, nuts, seeds and candied melon. And I tell you, it was really soo O good! It beats the store bought ones, hands down! Well done girl, looking forward to see another new batch this mid-autumn! It is the first time that I see a mooncake. It sounds interesting and looks tasty!